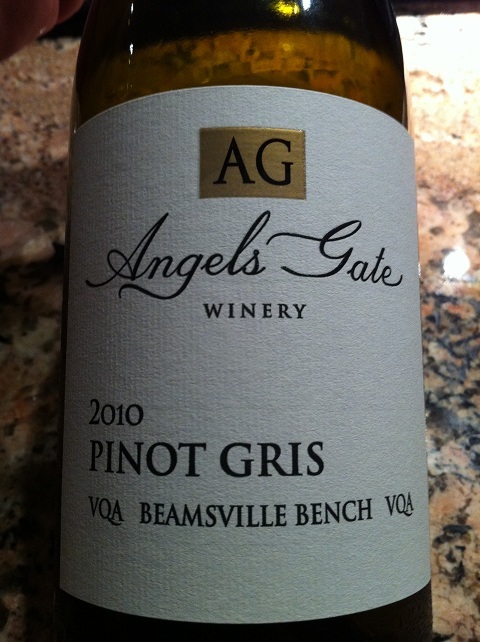 Angels Gate Winery is located on the Beamsville Bench, literally seconds/minutes from a handful of other vineyards recently reviewed (Hidden Bench, Tawse) or to be reviewed shortly (Fielding, Rosewood). Nestled midway up the Niagara Escarpment, the views as you drive in and walk around the property are fantastic. Green vineyards, blue skies, Lake Ontario in the distance, and on the day we visited you could make out Toronto, some 70 kms as the crow flies away. Within its beautiful main building is a good lunch option for anyone looking for a restaurant to complement their wine oriented day. We stayed for our Terrace Lunch and can easily recommend it to anyone. So if you are keeping score so far, we have food and a view. What about the wine? Opened in 2002, Angels Gate is more than just a beautiful property; it is a producer of over 14,000 cases of wine a year and encompasses six vineyards as well as utilizing two premium grape growers. Grapes grown are: Chardonnay, Riesling, Gewurztraminer, Merlot, Pinot Noir, Cabernet Sauvignon, Cabernet Franc, Malbec, Shiraz, Gamay, Viognier and lastly, Pinot Gris. It is the Pinot Gris that we will be talking about today, and amazingly enough this is one of three Pinot Gris wines that was recommended to me over the course of the Niagara Wine Week. Thought to be a mutant of the Pinot Noir grape, it gets its name from the conical shape of its grape bunches (pinot) and the grayish-blue (gris) colouring of its fruit. Our Italian friends call it Pinot Grigio and you are hard pressed to not find a Gris/Grigio on a retaurant patio during the summer months. If truth be told I am not a Pinot Gris fan, often it is pale, light and not much more, and the nice thing about this week has been the three Pinot Gris’ that have been almost forced onto me for trying and tasting. They opened my eyes slightly to the wine and I will ensure that I include having some from time to time just to keep an open mind. Let’s move on to the tasting. A very pale wine, this clear glass brought forward pear and tropical fruit. As you pour a glass and get into the tasting you will realize that this wine has good acidity that balances well with understated fruit. Pineapple and grapefruit fight for your attention. As the wine warms and opens you will note more citrus (lime) on your palate yet it retains its crispness. This is a good example of a white wine that is crafted to consume now, the fruit is strong enough to give the mouth something to enjoy but not so that it takes away from the acidity and cleanliness of the wine. At $19.95 it should fit into most people’s budgets and should suit those who are fans of Gris/Griggio. The CWG Subjective Rating is 85 out of 100. This entry was posted in Canadian, Wine and tagged angels gate winery, canadian wine guy, wine review. Bookmark the permalink.